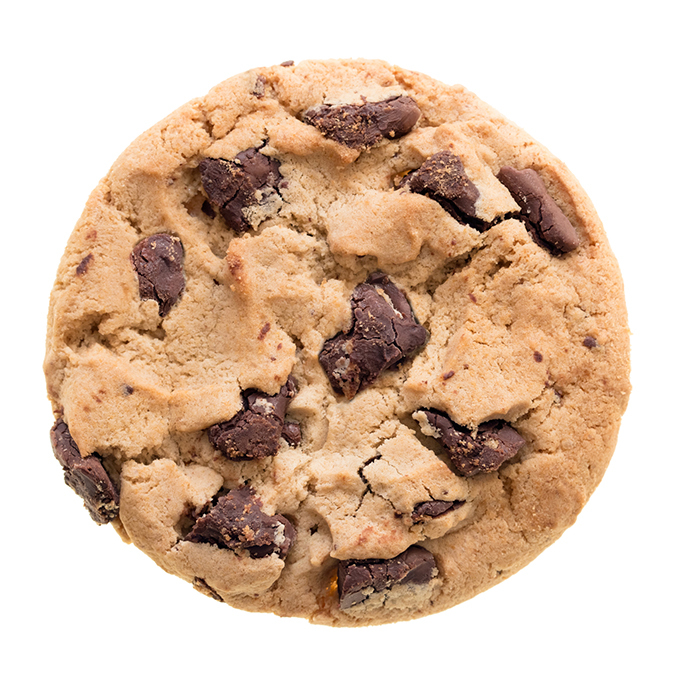 Here’s a question for you: When you get that craving for a warm, homemade cookie, and you finally admit that the only way to get it is to bake it yourself, do you bake just one? Literally mix up enough wet and dry ingredients to make a single cookie? Probably not. It’s wasteful, sure. But it’s also inefficient. When the labor to make one cookie is so comparable to making 12, you might as well, right? 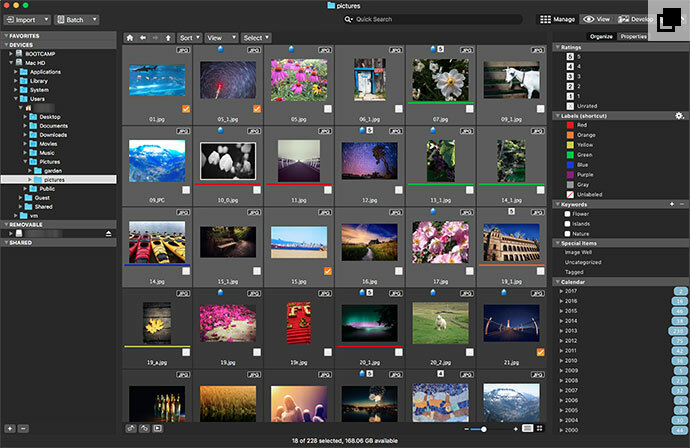 Well, the same logic applies to processing your photos—but even more so. With 12 cookies, you need to spoon each one out onto a pan. 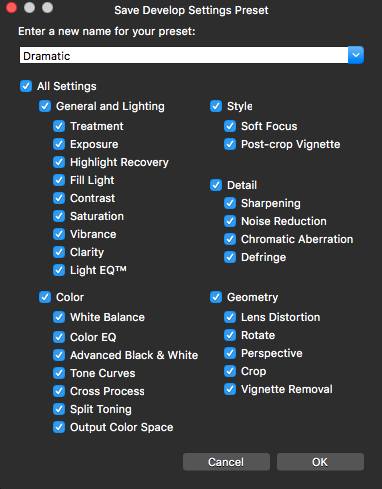 In ACDSee Photo Studio for Mac, with 12 photos, you can just click the first one, hold down SHIFT, and click the last one to select them. (If they occur consecutively in a folder, that is.) And if you are applying settings, such as changing the file format, there’s a good chance that you’re interested in changing a series of images taken in sequence. Also, using the Batch tool guarantees that the settings you are using are being applied consistently across all of the selected images. 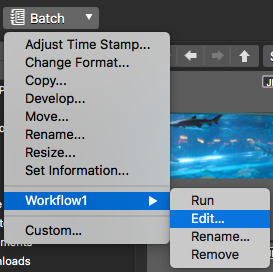 You can create your own batch workflow with a set of actions in the order you want them applied, and save them as a preset. Meaning you handed your robot servant the cookie recipe and left to go take a nap. (Although batch processing takes minutes only, so the metaphor falls apart a bit here.) 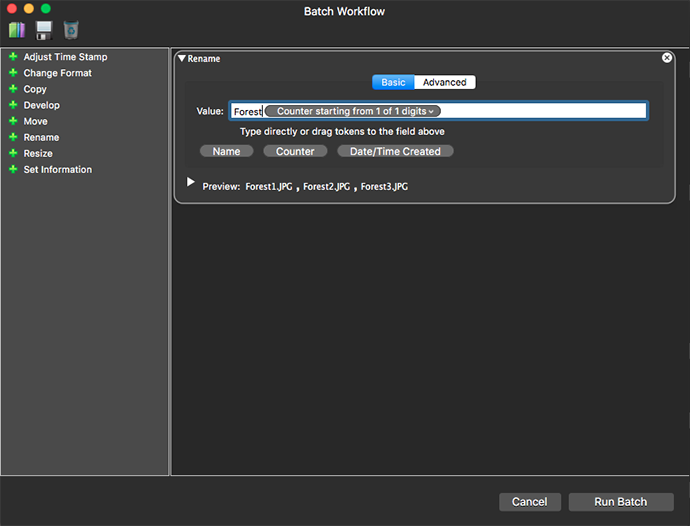 You can create a custom batch workflow to automate the tasks you find yourself doing over and over, like renaming or converting your files to another format. I guess what I’m trying to say is, why stop at cookies? That robot servant can do your household chores too. What actions can you apply in batches? Adjust Time Stamp: Adjusts time and date of multiple files. Change Format: Converts the file into a new file format. Copy: Copies files to a specified destination folder. Develop: Applies specified Develop presets—preloaded ones, or ones you have created. Move: Moves files to a specified destination folder. Rename: Renames files with the specified format. Resize: Resizes files according to percentage, pixels, or print size. Set Information: Changes metadata information of files. Custom: Combines selected actions to apply multiple operations at once. All right. You ready to bake some cookies? Put on your apron. 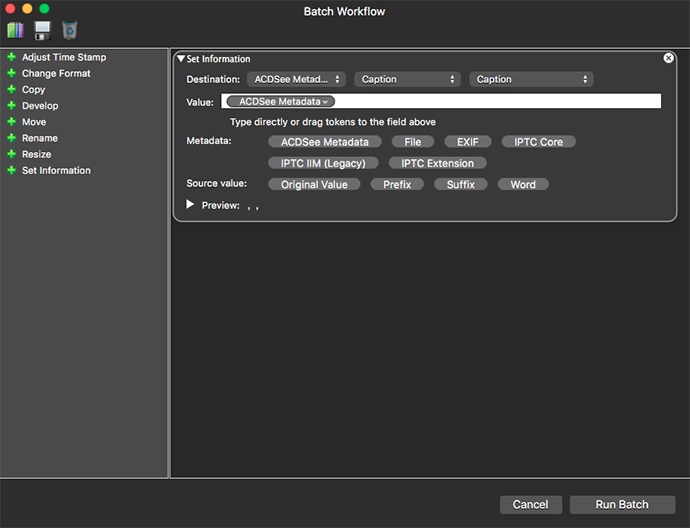 First things first: select the images to which you want to apply batch actions. 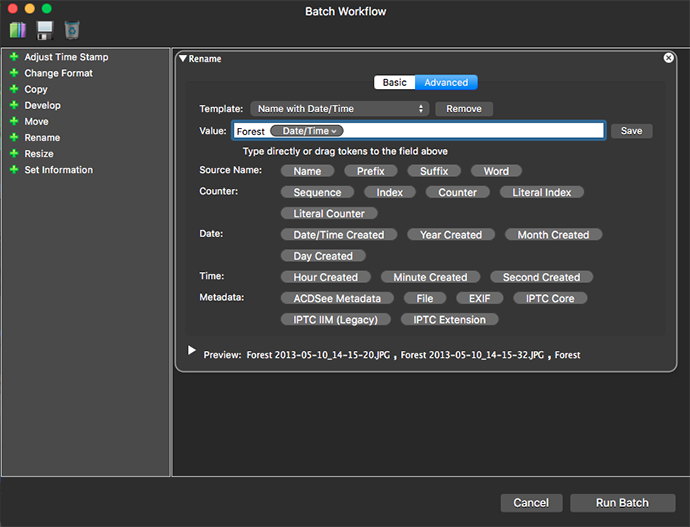 In Manage mode, click the Batch button on the top left corner and select Custom. 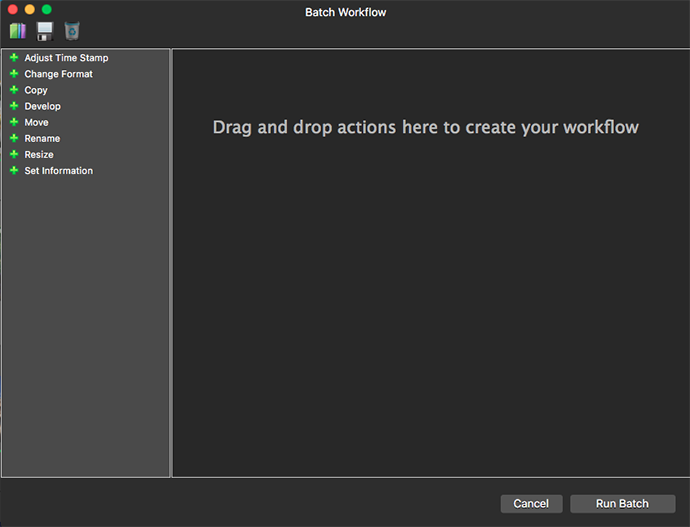 Or, control-click in the File List pane and select Batch | Custom. Or you can pick one of the items in the Batch menu straight away, such as Move or Rename. In View mode, click Edit | Batch | Custom. Or, control-click an image in the Filmstrip and select Batch | Custom. Or you can pick one of the items in the Batch menu straight away, such as Move or Rename. Yes, you’re only applying it to the image you’re viewing. Yes, this conflicts with our cookie analogy. 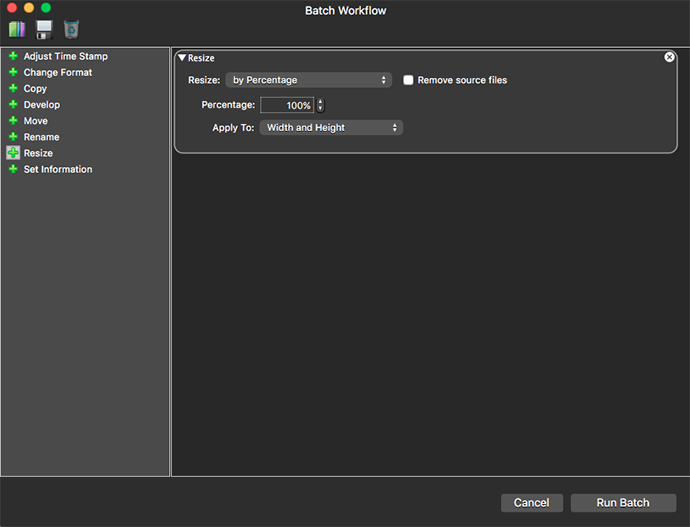 But—plot twist— “batch” doesn’t only refer to a batch of images. It can also mean a batch of actions. 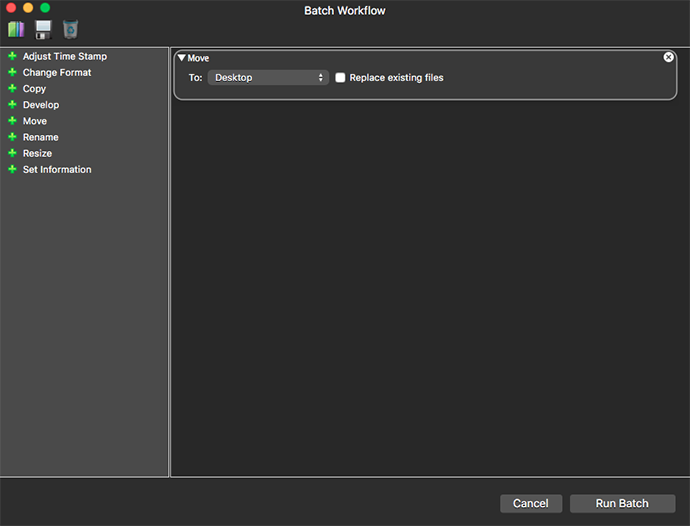 When the Batch Workflow dialog opens, you’ll notice there’s a column on the left with actions listed in it, and a large empty space on the right. Choose actions by dragging and dropping them from the left side into the right pane or press their green plus icons. 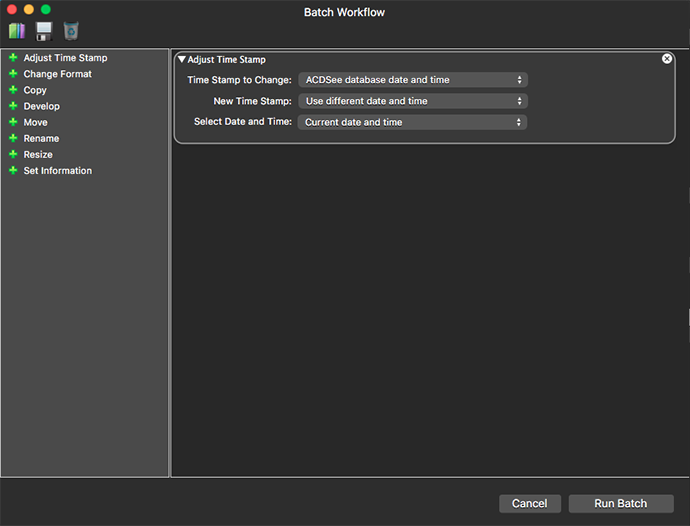 You can drag these actions above or below one another in order to customize the order of the batch workflow. We’ll talk about how to customize the settings of these actions to your needs in a moment. But for now, let’s say you have the actions ready to do what you like. From here you can do one of two things. 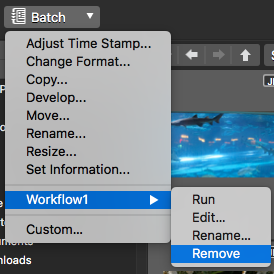 You can click Run Batch to kick off the process, or you can click Save Preset if you think you’ll like to save these actions and their settings for future use. More on that later. 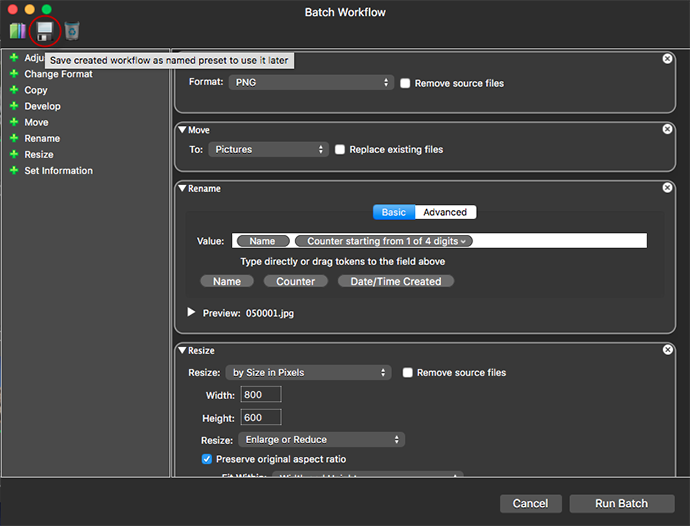 Before we get into the ways you can customize the batch settings, it’s worth noting that you can speed up the batch editing workflow by tagging your files. For instance, if you quickly tag the files you want to batch edit, then click Tagged in the Organize pane, it’ll display all of the tagged files. Then you just select all and click the Batch button. So what settings can you customize? What if your camera’s clock was set to the wrong time? What if you need to adjust for photos taken in the wrong time zone? You can select which time stamp to change from the drop-down. You can choose EXIF date/time original, File last-modified date and time, File creation date and time, and ACDSee database date and time. Then choose what the new time stamp will be: Use different date and time, Shift to a new starting date and time, Shift date and time by a specific number. If you picked “Use different date and time”, select between the following: EXIF date/time original, Current date and time, File creation date and time, ACDSee database date and time, or Use specific date and time. 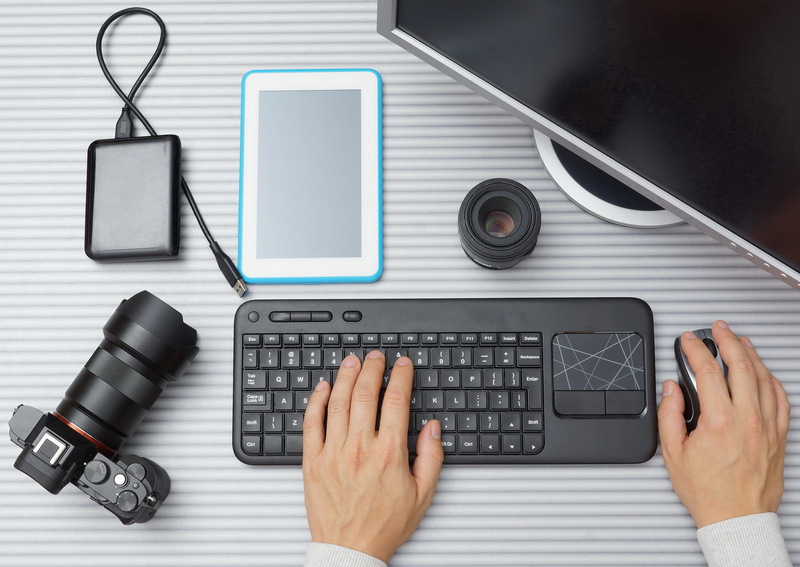 Choose a file format from the drop-down for converting your files. Then adjust the Quality slider or Compression option, depending on the format you chose. Select the destination for your copied files from the To drop-down menu. Select Replace existing files if you wish to replace any existing files. (What a coyly named option.) You can also create a subfolder to put the copied images in and give it a unique name based on the tokens you drag into the Name field, such as Date. 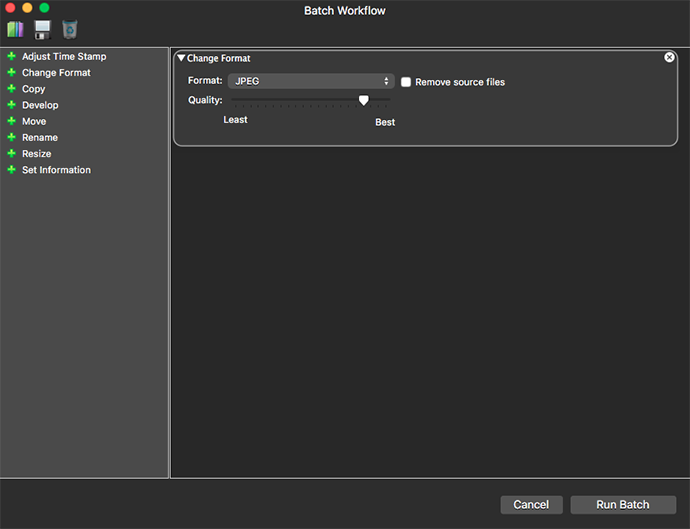 Batch Move has similar options to Batch Copy. From the To field, select a new destination for your files. Select Replace existing files if you wish to replace any existing files. 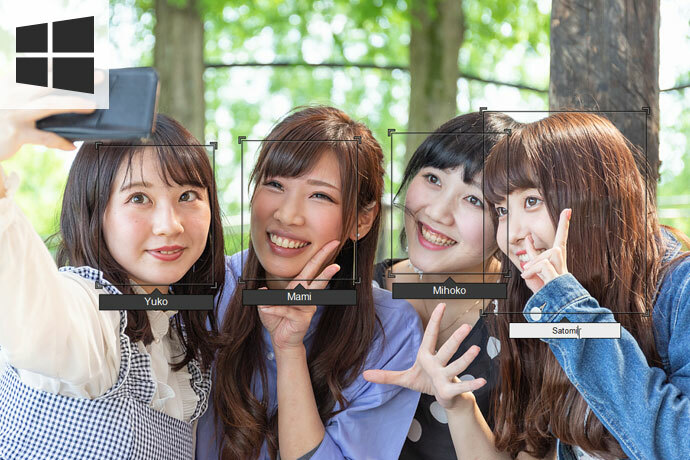 In the Value field, delete “Image” and enter a customized name. You can’t really go wrong as, if you look at the bottom of the box, you’ll see an arrow next to Preview. Expand that and you’ll see a table indicating what the file names are now and what they will be once renamed. by Percentage: Resizes the images to a percentage of their original size. 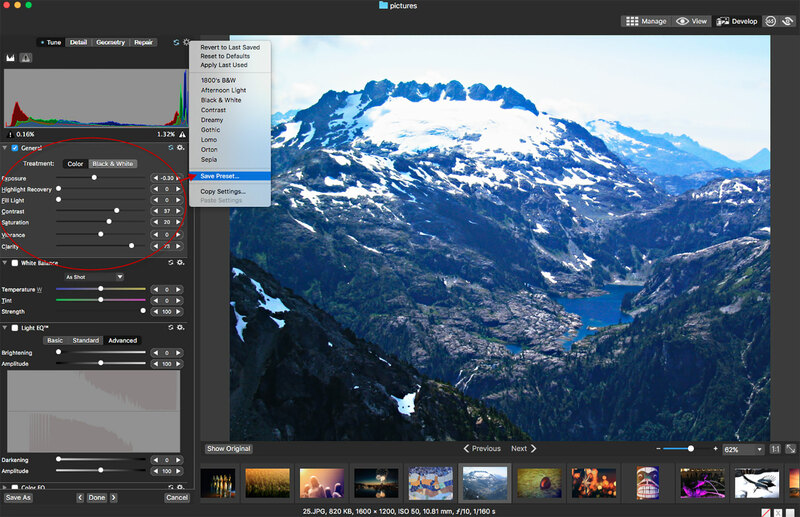 by Size in Pixels: Resizes the images to a specific size in pixels. Each has its own options, like whether the resizing should be applied to the width and height, or what units to use for the resizing. Stuff like that. You can change the metadata information of files. Use the Destination drop-down lists to drill down to the information field you want to change. For example, if you wanted to change IPTC Core keywords, you would select IPTC Core from the first drop-down, Content from the second drop-down list, and Keywords from the last drop-down list. Drag and drop Metadata or Source value tokens into the Value field. Or simply type directly into the field. Lastly, you can quickly batch process images by choosing a filter from the Presets drop-down menu. Need to turn a batch of photos to black and white? Well, here’s your one stop to get that done. This segues perfectly into a conversation about presets. And yes, I did that on purpose. Presets are a sequence of actions, set in advance for ACDSee Photo Studio to perform on selected files. For example, you can create a custom preset called “Copy_Rename” that contains the actions Copy and Rename. 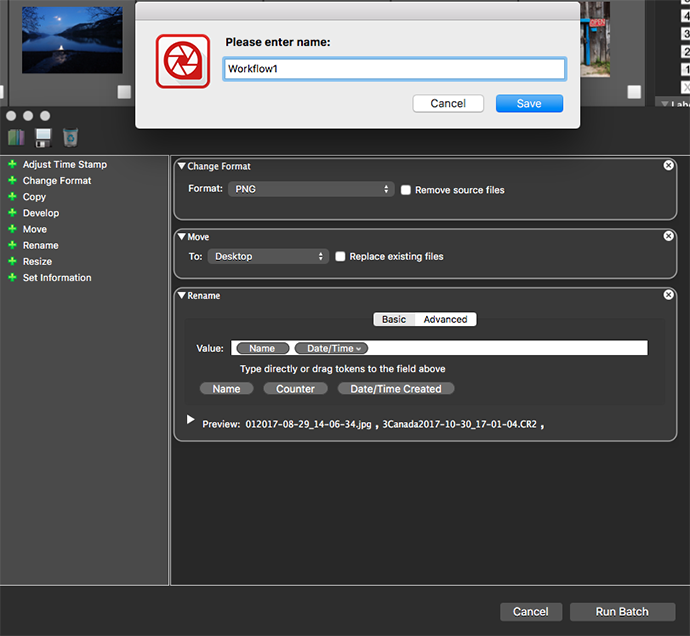 The “Copy_Rename” action will create a copy of your files and rename only the copied files. You can also create a preset with only a single action, such as “Move”. Presets can be modified and deleted at any time. So, basically do any of the above, press the Save button, enter a name into the field, and bam! You’ve saved a preset. 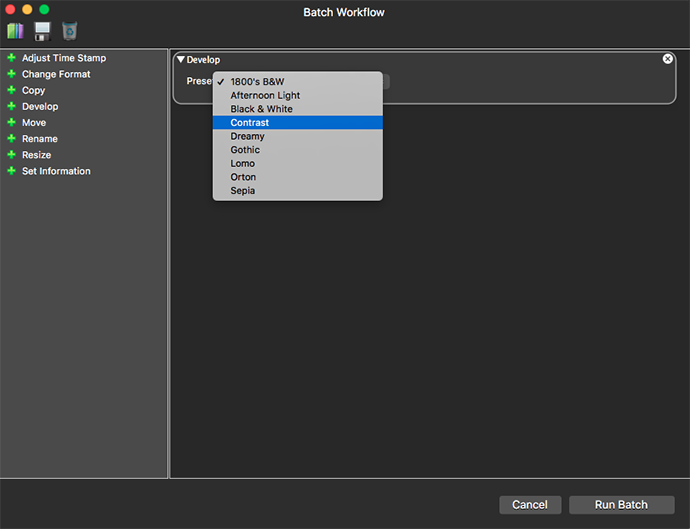 You can modify, delete, or share your batch presets with others. 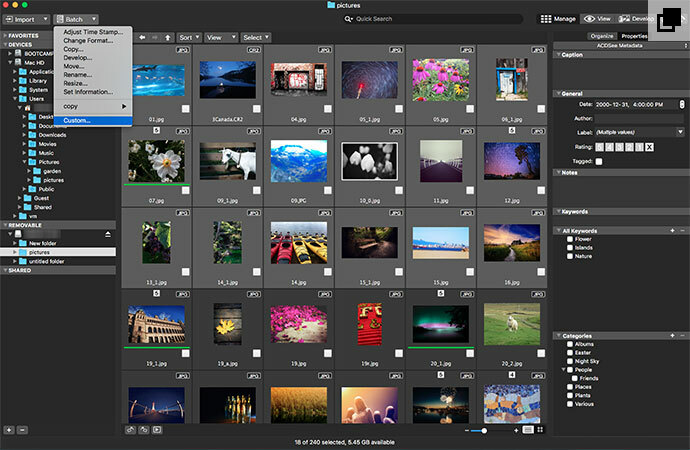 In Manage mode, select one or more images. Click the Batch button, and, from the drop-down menu, select the saved preset you want to edit. A menu will pop out to the side, providing options for that preset. Click Edit from the menu. 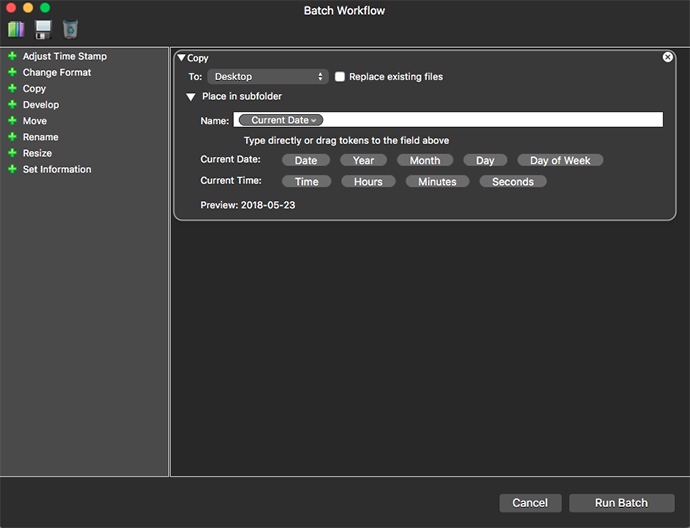 In the Batch Workflow dialog box, modify the settings. You can click the Close button on any action to remove it from the list. Click the Batch button and select the preset you want to delete. A menu will pop out to the side, providing options for that preset. Click Remove from the menu. Click Tools | Import Batch Presets. Click Tools | Export Batch Presets. And how about Develop Presets? How do you turn any development into a preset that you can then batch apply? Well, this brings us to Develop mode, of course. Make adjustments to an image using the Develop tools. Use the settings button drop-down menu in Develop mode to select Save Preset. The settings button is located at the top right side of the tools pane. Enter a name for your preset. You can deselect the checkbox of any setting you do not want included. Click OK. Your saved preset will appear in the actions drop-down menu in Develop mode. Now your saved preset will be on the list of Develop presets in the Batch dialog, like any other. You can apply them as mentioned above. Oh, and you can share them too. 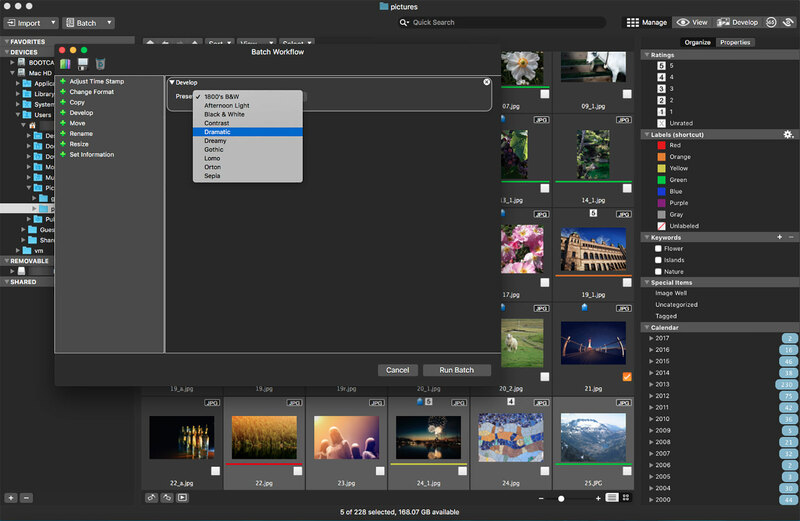 Click Tools| Import Develop Presets. Click Tools| Export Develop Presets. And that’s all there is to it. 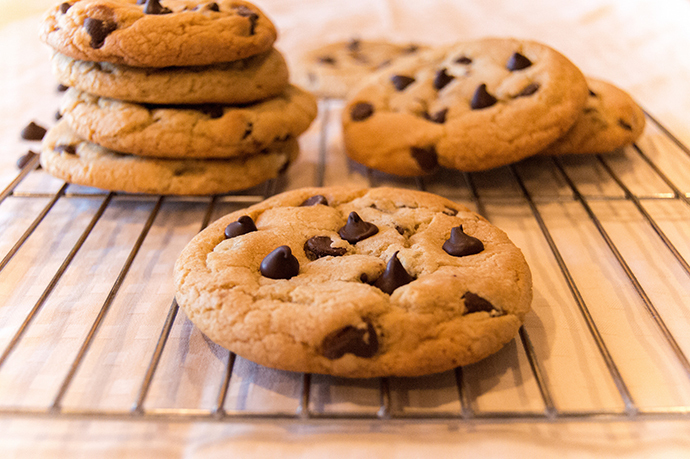 So now you can bake your cookies and eat them too. Happy time-saving!